Published on December 13, 2010 in Fun Stuff, How To Save Money, Positive Thinking and Tactics. 1 Comment Tags: Finding Money, Loose Change, Money On The Sidewalk. Want to get more done? Get your hair done! Published on December 7, 2010 in Creativity, Motivation, Positive Thinking, Tactics and Time Management. 1 Comment Tags: Save Time, Time Management Tip, Time Saving Tip. This is one of the many emails I get that illustrates how the strategies I teach are so simple, yet so effective. The RPM/Gap Management session we did on Wed has got me so focused. And those plastic files, so simple BUT what a difference – I’m just dying to cross everything off my lists! Off I went to my hairdressers appointment files in hand. In between hair colouring, setting, washing, trimming and blow-waving I literally crossed off 6 things from my list that have been waiting months and occupying mindspace. They were some outstanding appointments, claims and follow-ups. Man – how free do I feel!?!?! The only thing I didn’t do which would’ve been so cool was to get them to take a photo of me… Next time. Published on July 30, 2009 in Motivation, Positive Thinking, Strategy, Tactics and Time Management. 0 Comments Tags: Personal, Personal Mastery, Progress, Testimonial, Time Management. Published on July 15, 2009 in Antimimeticisomorphism, Tactics and Videos. 1 Comment Tags: Coupon Savings, Coupons, Discount Coupons, Grocery Bill, Money Saving, Save Money, Save On Groceries, Save With Coupons, Savings. Even though saving coupons is much more prevalent in the United States than it is in Australia or Canada, this short video shows how someone with concentration of focus can achieve extra-ordinary results like save 97% of the grocery bill. It’s a short video that explains how she does it. I challenge you to watch it and take notes – I am sure there is AT LEAST ONE MONEY-SAVING TIP you can pick up. Of course, when you do, it really would be nice if you posted a comment here for others to learn from! Published on February 16, 2009 in Antimimeticisomorphism, Strategy, Tactics and Time Management. 1 Comment Tags: Effective Use Of Time, Goal Setting, Goals, Managing Priorities, Marc Dussault, Multi-tasking, Overwhelm, Time Management, Time Management Tip. 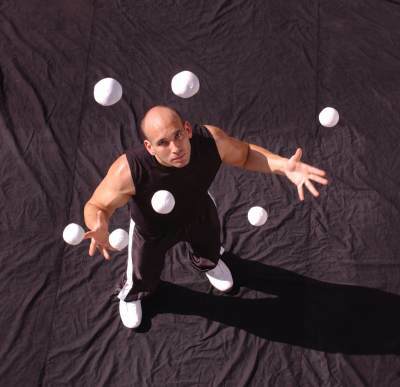 Juggling 10 balls and dropping 6 is not like juggling 4 balls. First of all it’s a lot harder and you don’t look very good dropping the 6 balls even though most people can’t even juggle 3 balls. That’s the point – PUT THE BALLS DOWN AND JUGGLE THE ONES you can handle THEN and ONLY THEN do you toss another ball in the air. Successful people juggle a lot of balls and the less successful think it’s the way to go – doing MULTIPLE things at a time. It’s not. It’s a recipe for disaster and makes you look foolish. Stop it! Re-gain your compose, reduce your stress and improve your results. That’s it for today – short and sweet. Published on January 29, 2009 in Tactics. 0 Comments Tags: Marc Dussault, Overcoming Procrastination, Procrastination, Reduce Anxiety, Reduce Pressure, Reduce Stress, Tip. Today’s post is a simple one, but something that can IMMEDIATELY reduce your tendency to procrastinate. We all procrastinate, but successful people do it less and therefore get better results, yes with less effort. I explain the underlying strategies this post is based on in my book “Get The Best Business Results With The Least Amount Of Effort“. If you haven’t yet purchased it, you really should. The title says it all and for $27 it’s a real bargain. Overcoming procrastination requires that you KNOW WHY you’re procrastinating. One of the top reasons is that you MAGNIFY a problem or TO DO item automatically, without knowing it. You make it bigger than it actually is. Make a list of 10 things you need to do this/next week. Make a SECOND list of 10 things you DID last week. Compare the two lists. I guarantee you your TO DO list for this/next week looks like MORE, HARDER, LONGER TO DO than your previous week’s list. Just like a side rear view mirror on a car, your problems and to do list items appear bigger than they really are. Chunk down your to dos into EASY, DIGESTIBLE PIECES… You know the joke “How do you eat an elephant? … One bite at a time”. You get the picture. The thing is UNLESS you deal with this magnification problem, you’ll keep hesitating and procrastinating about things you really do need to get done and off your list! Just remember you are the one HOLDING the magnifying glass! Published on January 24, 2009 in Motivation, Positive Thinking, Sales Mastery, Squash and Tactics. 1 Comment Tags: Champion Mindset, Marc Dussault, Mindset Of A Champion. In this action–packed 1–hour presentation, Dr Marc Dussault a self–made multi–millionaire business and Internet entrepreneur and squash fanatic will reveal the tips, tricks and techniques that catapulted him from a 38–year old first–time novice to a ‘top 50’ world ranking in Masters Squash in less than 7 years. The 4 Keys To Success: How to create any outcome you want and reproduce it over and over again, effortlessly. The 3 Ways To Get To A Destination: How ONE simple decision at the beginning of your training will affect whether or not you’ll ever win a tournament, competition or lose those extra kilos. Your Decision–Making Horizon: How it affects your training regimen, motivation and chances for success. You might be setting yourself up to fail and not even know it. How To Quickly Learn Any New Skill: Regardless of the sport or fitness regimen you’re involved in, there are skills to be learnt. Understanding HOW you learn will help you learn faster, reduce costly mistakes and most importantly avoid injuries. Leveraging a MasterMind Group: All elite athletes have a group of advisors, coaches and mentors, but the trick is to decipher and organise conflicting information that is supposed to help, not confuse you. Fitness buff who wants to learn a few cool things that will make your workouts more fun, engaging and motivating – getting into the mindset of a champion is exhilarating and all the time spent training can be put to optimal use with Concentration of Focus strategies that will be covered. Casual Sport Athlete who wants to learn ‘shortcuts’ without cutting corners to improve your performance and most importantly avoid injury and soreness. Elite Athlete who wants the ‘edge’ over your competitors. Dr Dussault can outplay competitors who have been playing for 30 years even though he only picked up squash in his late 30’s. That is an edge that every elite or competitive athlete wants to have – you’ll get that edge at this presentation. Mature Athlete who wants to extend your sports career, reduce risk of injury and improve your recovery times. Dr Dussault’s strategies are disarmingly simple and effective for people of all ages and sports. Motivational Personal Development ‘junkie’ always looking to attend a fun presentation where you’ll something new in a setting with other super–achievers who all want the same thing – learn how to win with the least amount of effort! This is a fun, interactive session organised exclusively for Geelong Re-Creation Health Club Members. It is not a ‘canned speech’, rather a personal revelation of strategies that will help you out–perform your opponents with minimal effort. As Australia’s #1 Exponential Growth Strategist, Dr Dussault is an accomplished and polished professional speaker. At this session, he will not be wearing a suit and tie nor will he be presenting using PowerPoint, preferring to keep the conversation light and filled with anecdotes and stories that will captivate your attention and expand your belief in what you’re capable of. In so doing, Dr Dussault will present using only a whiteboard to allow for questions and answers to encourage active audience participation. This presentation, valued at $297 is our gift to you – you can bring a friend as long as you promise to let us know if for any reason you and your guest are not able to attend on the day so that we can release your seat to someone else. Spaces are limited to 40 participants and we expect to have a waiting list for this one–time–only session. When You Attend, You’ll Get BONUSES!!! This exclusive session is our gift to you – please feel free to share it with your close friends, family and/or work colleagues, anyone who likes to have fun, and enjoys sports and fitness training. Published on January 4, 2009 in Tactics. 6 Comments Tags: 1 percent improvement, CANI, Continous And Never Ending Improvement, Distinctions, Marc Dussault. Published on October 23, 2008 in Strategy and Tactics. 2 Comments Tags: Circle Of Influence, Freedom, Marc Dussault, Personal Mastery, Self Awareness, Strategy, Tactics. I won my match today. Decisively. 9-0, 9-2, 9-2. Today’s lesson is so simple but so powerful it’s a classic. STRATEGY will beat TACTICS 9 times out of 10. Today was all about STRATEGY over TACTICS. My opponent today has a TACTIC that he uses and I am sure it works for him – it’s the TACTIC of intimidation with a bump and grind interference game – the goal is to get in the person’s way as much as possible and get lets and strokes awarded and keep the other guy off his game and make sure he never gets to use his STRATEGY. That works UNLESS someone has a STRATEGY to counter-act this TACTIC. So that TACTIC doesn’t work on me. AND it works against the person who RELIES ON IT TO WIN, especially one who doesn’t have the talent or STRATEGY to adapt. So I stuck to my STRATEGY and took the match in what must have been less than 15 minutes in total. Just put the ball away from where you are – LITERALLY. That way he can’t be interfering with you if he’s chasing the ball all over the place! BECAUSE this is his TACTIC, he’s not used to running for the ball, so my shots don’t have to be as accurate which makes it EASIER for me to actually win. It’s a great feeling when you can turn someone’s TACTIC against them – kind of like in Judo when you use the other person’s weight and momentum against them. Fun stuff when you’re SMART enough to know the STRATEGY and then good enough to deploy it! Now that I got the squash stuff out of the way, I guess the lesson for business and life is pretty self-evident, but just in case, here it is. Whenever someone runs a pattern or TACTIC against you, there usually is a STRATEGY that can counteract it effectively – first, neutralising it and second, leveraging it to your advantage. If a competitor is TACTICAL and aggressive about a particular TACTIC, you can learn to counteract it and USE it to your advantage. Competitors who are TACTICAL usually have 1, 2 or 3 TACTICS at most. With a STRATEGIC approach, you can easily win the game. Once achieved, you dictate the game, pace and outcome. As I discuss in my books “Get The Best Grades With The Least Amount Of Effort” and the business person’s edition “Get The Best Business Results With The Least Amount Of Effort“, I play squash to expand my Circle Of Influence™. As I do that in squash, I begin to see parallels and comparisons in my personal, financial, emotional and business lives that until that moment remained hidden. Those awakenings are priceless lessons in self-awareness that make the journey enlightening and rewarding beyond description. I get to see and be with the best in the world doing what they do best. As I observe, as an ACTIVE PARTICIPANT in the process, I can extrapolate my own experiences, emotions, thoughts and feelings to other matches and situations as I simultaneously interpolate and interpret other people’s experiences within my own new, expanded Circle Of Influence™. I urge you to do as I suggested a few days ago that you really should (if you’re not already doing it) engage in something OUTSIDE of work that inspires, motivates and empassions you to become the best at it. This can be a sport, musical instrument, hobby or body of knowledge. Start today and take one SMALL ACTION and you’ll soon realise you’re on the path to self-discovery that will embolden and empower you to consider boundless opportunities with timeless abandon. When you’re ‘there’, someone will have to remind you that you’re “45″ and not a teenager running around a white room chasing a little black ball.. But it won’t matter – you won’t care because you’ll be having the time of your life, living it as you should – to the fullest, care free and with child-like abandon!